Upon signing the hotel contracts, planning for the 2011 Delta Air Lines conference at the Swan and Dolphin Hotel began in January and quickly developed. Momentum: Leverage.Deliver.Win. 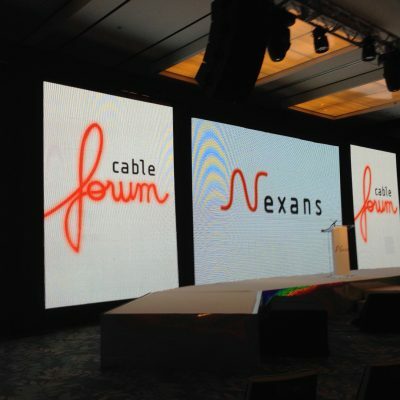 was selected as the dynamic event slogan. Guest registration and bi-weekly newsletters were automated and executed via a state-of-the-art, user-friendly web portal. As guests stepped off the plane, hotel check-in registration, ground transportation, and every logistical detail in between were seamless thanks to a team of project managers. Event branding was a combination of Madison Avenue promotional genius and purposeful execution. 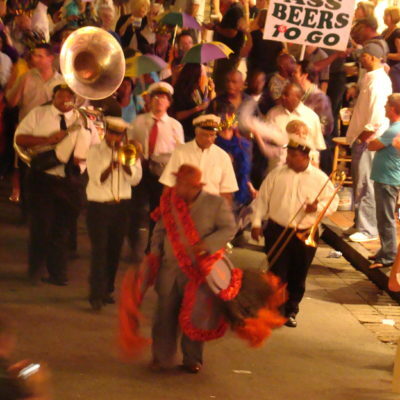 Outside the hotel flew large, customized flags flew from custom-built poles. Vinyl decals and large maneuverable posters, each representing the ninety-seven countries represented by Delta, were displayed throughout the convention space along with a directory of everything from meeting locations to the company store for quick and accessible information. 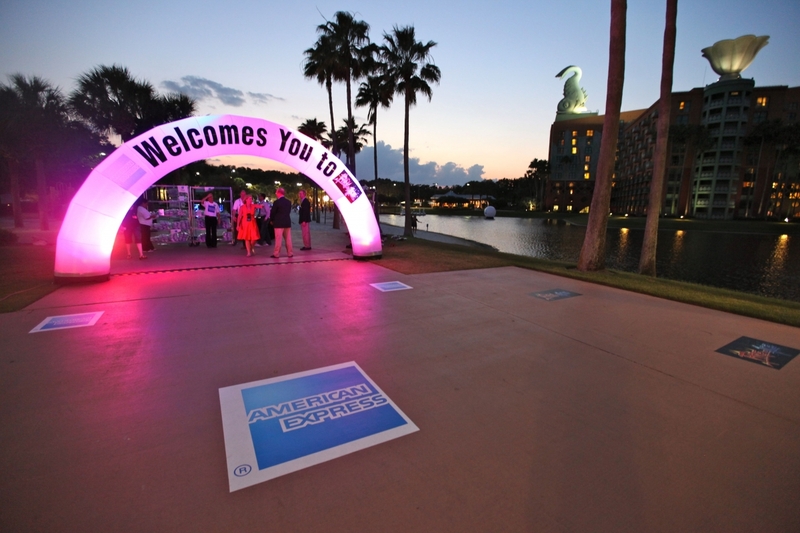 Walkways guiding guests to hotel elevators added a subtle touch of grace. 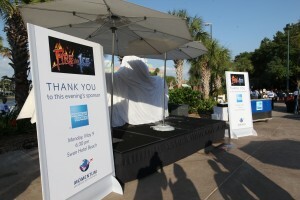 Each evening event also received many examples of the same type of branding; for instance the lighted eight-foot box, which morphed seamlessly with change of fabric showcasing each evening’s sponsor. Eco-friendly registration bags featured refillable water bottles, note pad with pen, and a portable hard drive of slideshows and handouts. Etched nametags added a stylish alternative to the paper and vinyl holder type. The state-of-the-art general session included speeches by Delta’s marketing vice president and the Chief Operation Officer. 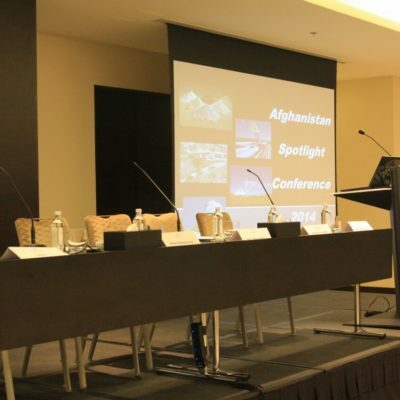 Twelve breakout sessions paired with an equal number of workshops by experts and motivational speakers kept guests engaged and focused, leading to a commendation from a senior V.P. as to our efficiency in keeping nearly a thousand participants off smart phones or otherwise distracted. 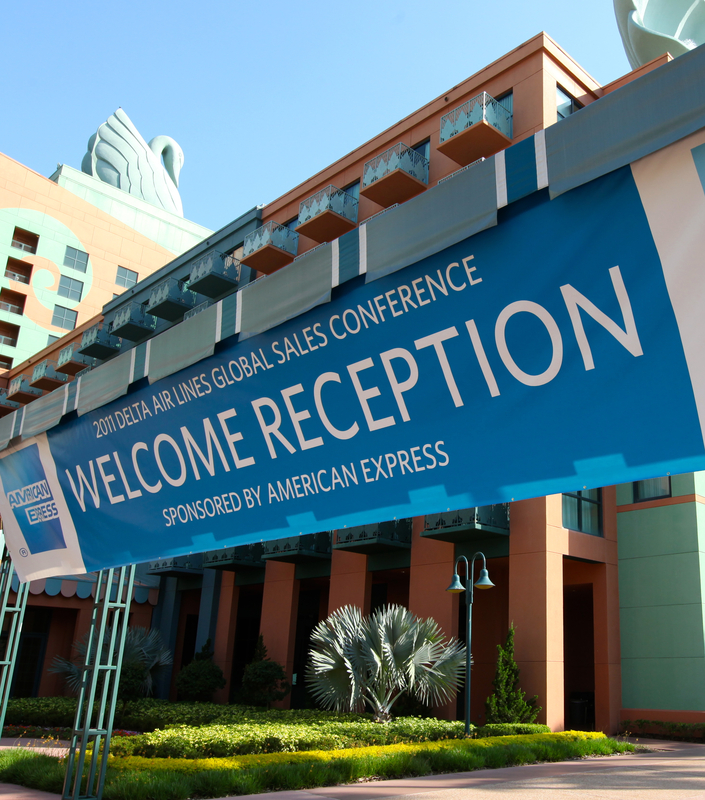 Coca Cola, Delta Private Jets, T-Mobile, and other travel-related organizations comprised a distinguished vendor and co-sponsor list. Each day consisted of a breakfast, a themed lunch with coordinating linens, and several healthy, fun afternoon breaks. The conference was community-driven in two ways: a silent auction and t-shirt sales raising $20,000 for earthquake victims and employees assembling 350 backpacks stocked with school supplies and 900 clean kits consisting of toothbrush, paste, shave cream and razor, all distributed to local homeless shelter. 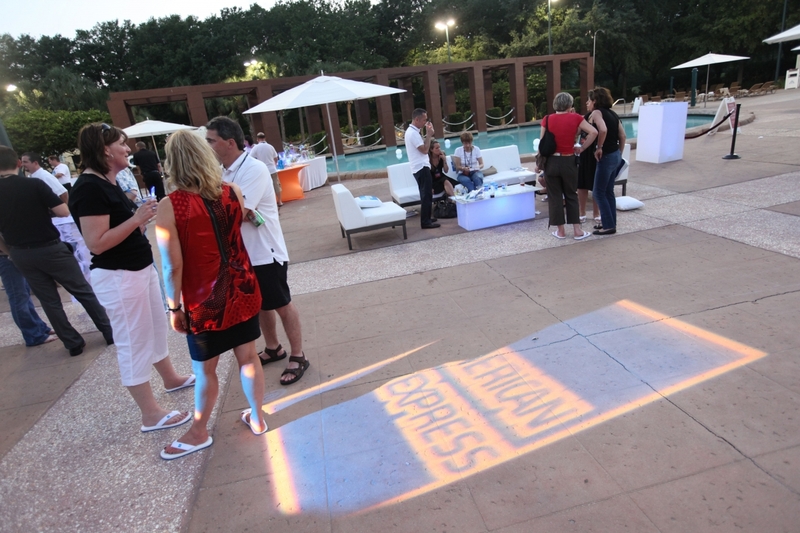 The “Fire and Ice” welcome reception, sponsored by American Express featured the company’s iconic blue box logo contrasted with flame orange as the color scheme. 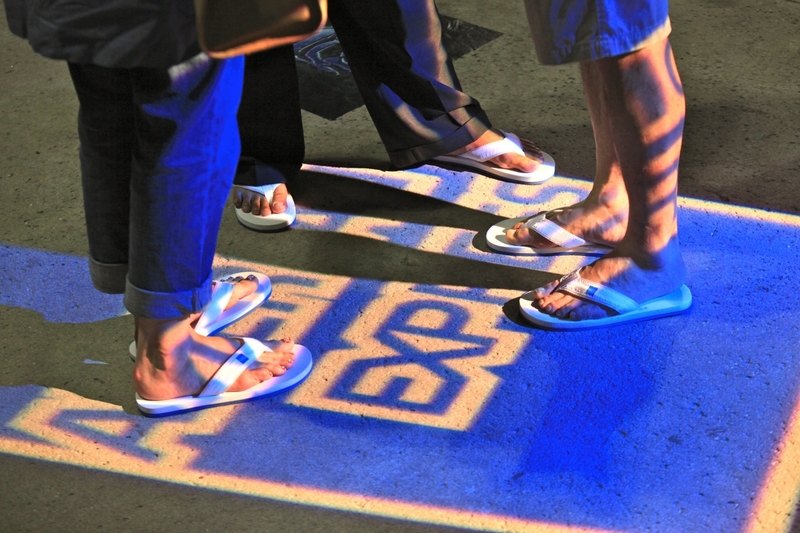 Guests were encouraged to wear beach attire and upon arrival, donned flip-flops emblazoned with the Amex logo leaving the legendary financial institution’s footprints in the sand as they made way to a colorful reception steps. 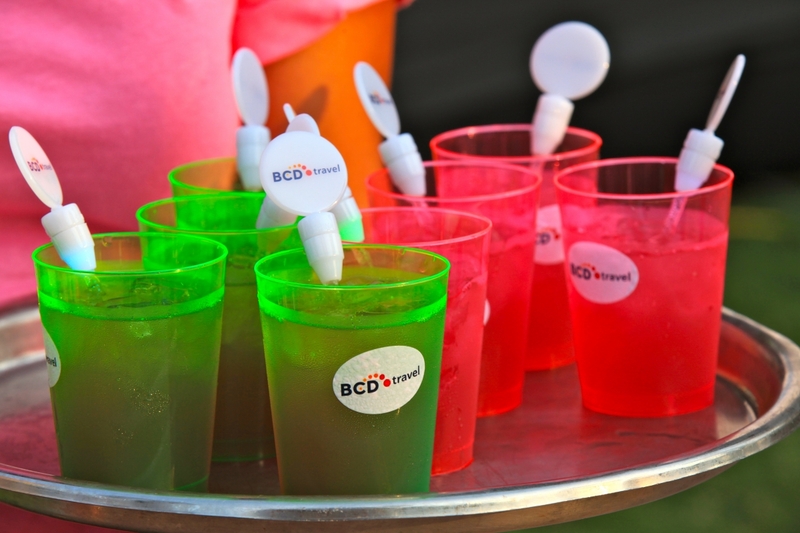 Guests marveled at a show of fire and ice sculpture performers while bartenders served colorful concoctions in event-themed cups; not surprising, ice cubes and swizzle sticks bore sponsor logos as well. A multitude of food stations were covered in silver tops with orange and blue linens. 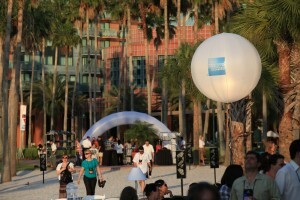 Featured were a chop salad bar, gazpacho lollipops prepared on an anti-griddle, a shrimp cocktail tray sculpted from ice, chicken kabobs, sliders, and, for dessert, ice cream prepared on a liquid nitrogen bar. As if it were even necessary, the décor was enhanced by none other than, fire and ice centerpieces. 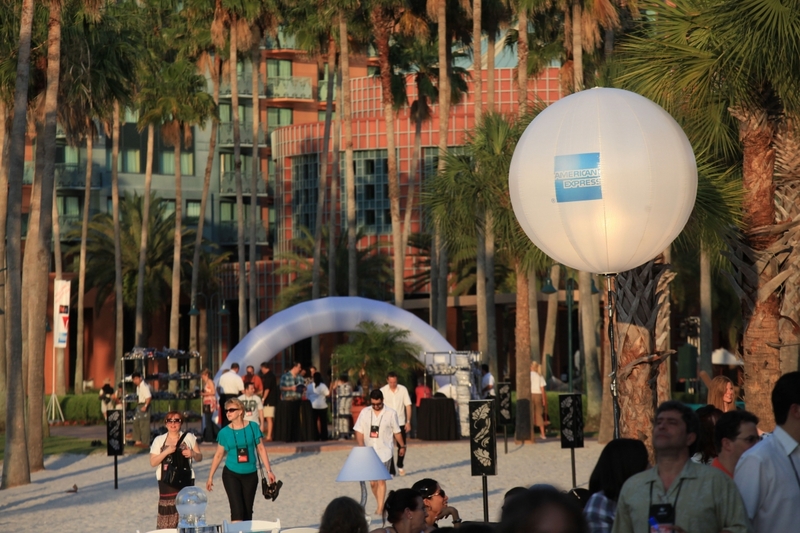 In its periphery, large lighted Airstar balloons, a company-branded sand sculpture, vinyl event signs, modern tiki torches, and custom embroidered white furniture were strategically displayed. The evening was capped off by a disc jockey perched atop of a white Hummer emblazoned with the Amex logo. 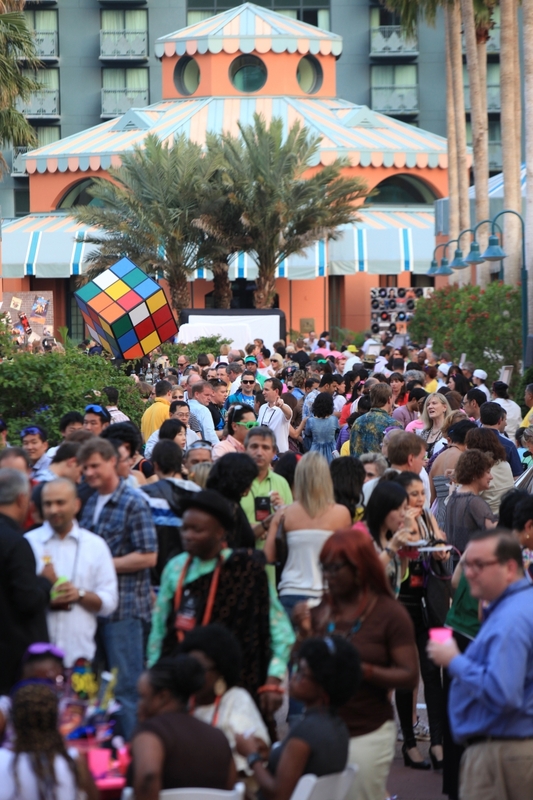 Day two’s “Love the 80’s” party, sponsored by BCD Travel and spirits giant Brown-Foreman asked guests to don their best 80’s inspired costumes. 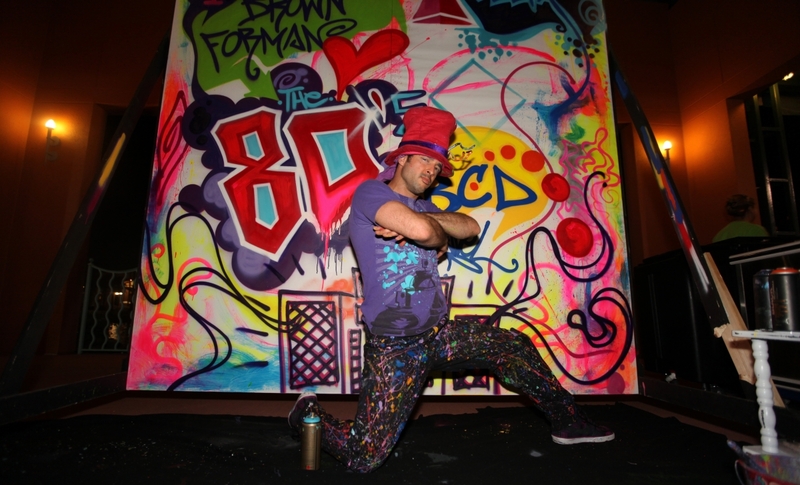 The evening paid homage to the era of valley girls, catchy slang phrases and bright neon colors. 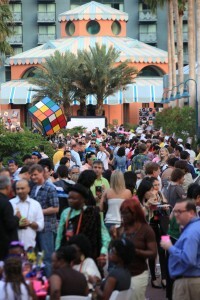 Food stations looked like the ubiquitous puzzle game, as did the centerpiece glow bar, which was topped with a giant custom-made replica of a Rubik’s Cube. 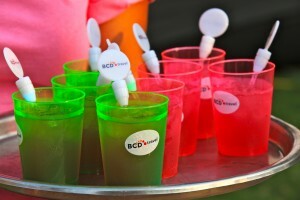 Food and beverage stations were combined so that coordinating cocktails complemented each food selection; for instance Crab and Watermelon was paired with the “Velvet Elvis” and Chicken and Waffles was paired with a Southern Comfort drink. The champagne and dessert station had a brick wall backdrop, which was adorned with many 80’s elements. A menu sign was placed next to each station, which included the food, drink and sponsor. 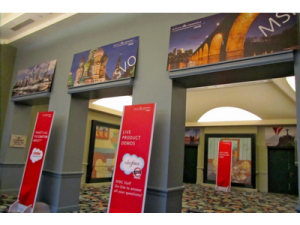 Large fabric banners with sponsor logos were designed to not only help keep out the public but serve as a unique backdrop to each station. 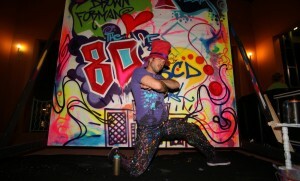 Additional design elements included entertainment consisting of vintage arcade games and an interactive graffiti artist. The stage for “Rubik’s Cubed: The Band” was made of large sails, guitars and other 80’s iconic elements. 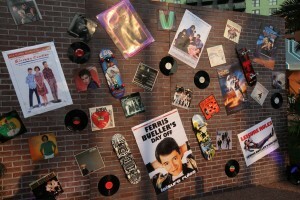 An “album wall” festooned with covers of era albums and a lighted dance floor strewn with movie posters completed the retro theme. The focal point of the evening was a custom designed candy station, which looked like a giant Rubik’s Cube. The station consisted of lighted cubes with a bowl of nostalgic sweets such as Fun Pop Rocks, Fizzy Zotz, Charms Blow Pops and Candy Necklaces put the finishing touches on the throwback theme. The final night, “Chefs and Champagne”, showcased an anti-gravity living chandelier and a champagne glass-clad model greeting guests with glasses of bubbly upon their arrival. Guests arrived in evening attire and walked down a living red carpet with a gorgeous model at the end. The silver, white, red and turquoise color scheme aptly honored sponsor Carlson Wagonlit. 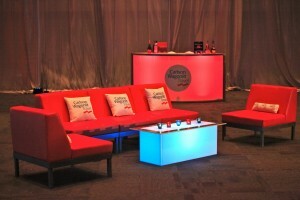 Its company logos were embroidered on white custom furnishings, pillows and displayed on bar fronts and lighted gobos. The evening started with a cool jazz group playing from a crisp, white stage with crystal bead backdrop. The video mixing disc jockey soon took over with dynamic effects reflecting off the lighted dance floor. The delectable food stations included “Not So Traditional Waldorf Salad”, Duck Confit and a very innovative dessert station, Nitro Kettle corn, which smoked when eaten. “Bon Bon” girls dressed in cute costumes passed out the fun treats and snapped souvenir Polaroid pictures. 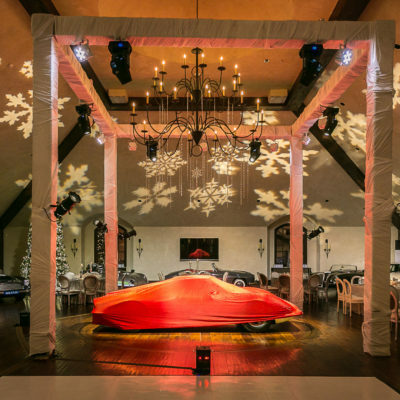 Other décor highlights included beautiful lighted trees, five hundred feet of pristine white pipe and drape, Parthenon-reminiscent crystal columns and a suspended chandelier of Swarovski crystals.